Preheat the oven to 350º. Season chicken breast with salt and pepper, and bake 20-25 minutes, until cooked through. Once cooled, slice into thin pieces. Change oven temperature to 425º. Peel and chop your butternut squash. You'll only be using half of the amount the squash yields, so save the other half for something else (like soup or a sauce for spaghetti). Line a baking sheet with tinfoil, and spread squash evenly on the surface. Drizzle with olive oil, season with salt and pepper, and toss with a spoon or spatula to make sure pieces are evenly coated. Roast for about 20 minutes, or until they are easy to pierce with a fork. Let cool. The steps above can be done ahead to save time. Tear kale leaves away from the stem into bite sized pieces. Place kale in a large bowl with spring greens. In a small bowl, combine red wine vinegar, honey, oil, and salt and pepper. Whisk until combined. Dress the leaves, pouring a little at a time. You don't want to have a pool of dressing at the bottom of your bowl. If you do, hold the lettuce back and pour extra dressing out. 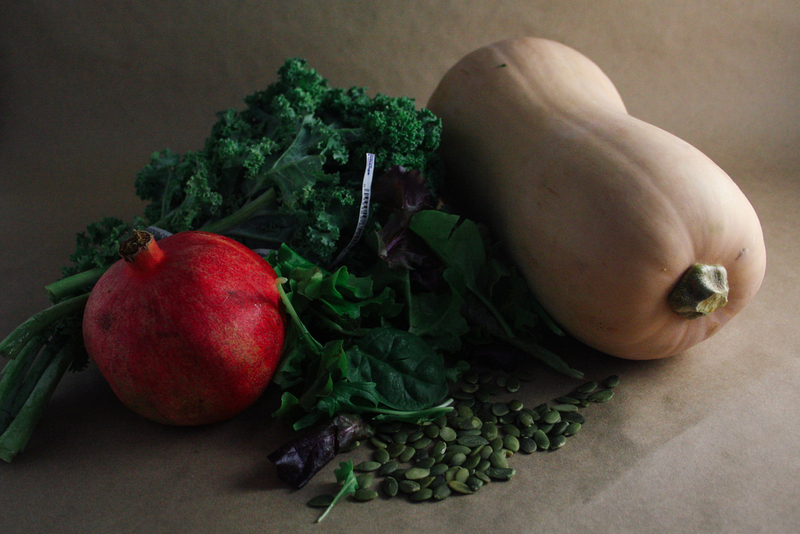 Add butternut squash, pomegranate, and pumpkin seeds. Toss to combine.